Every year, our congressional representatives hold an art contest for students in their districts, with the prize being a yearlong exhibition at the U.S. Capitol in Washington, D.C. It typically does not cause a murmur. This year's unanimous winner in Missouri’s 1st District was my friend David Pulphus, a quiet, gentle, unassuming student. David’s painting hung for six months in peace. 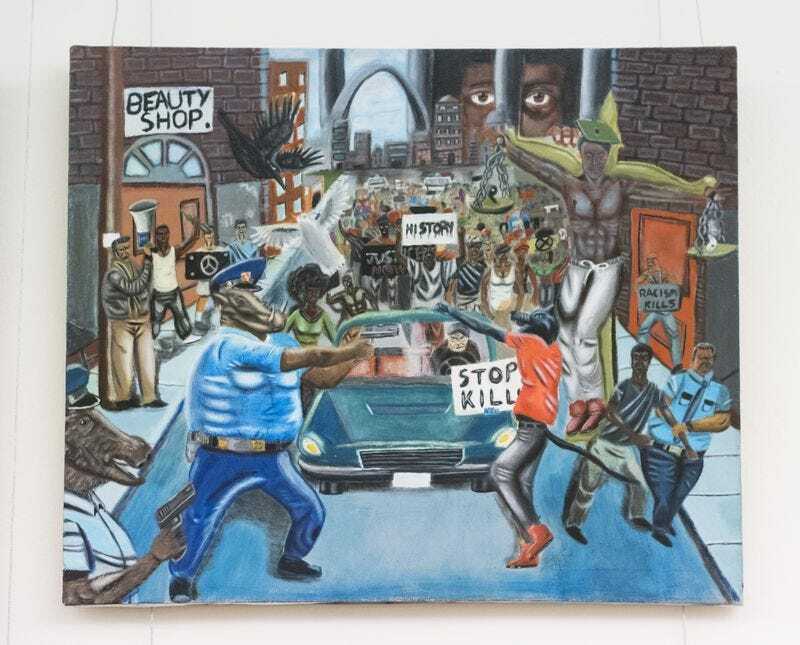 In December 2016, his painting became troublesome for law enforcement, conservative publications and some politicians. The painting featured two officers with boar heads and human bodies drawing their firearms. The other officers in the painting were fully human. There was also an African-American male being crucified in a cap and gown. It portrayed police and community relations as David and I saw during the Ferguson crisis. Their actions challenge democracy’s essence and highlight the privilege that white people in positions of power wield: immunity. It is unimaginable that either David or I could enter the Capitol and remove the statue of slavery advocate John C. Calhoun without being accosted and likely arrested. The representatives are demonstrating that rules and laws apply only to certain citizens. The misplaced anger of these “authorities” fails to address critical issues pertinent to conditions in African-American communities, police-community relations and constitutional rights. Art imitates life, but no critic has asked the fundamental question the painting raises: Why would a young student with hope, promise and purpose perceive our community and the police in such a manner? The officials did not take into account the role that militarization of policing has played in African-American communities (including Ferguson, Mo., and St. Louis), or the way that stop and frisk and pretext stops invade the privacy of African-American citizens. These are things that I have personally experienced. The police-involved shootings of unarmed and legally armed African Americans also have apparently not pricked the consciousness of the "art critics." The depiction in the painting is implicitly understood among African Americans, but less so by whites. A 2015 Pew Research Group poll showed a wide chasm between blacks and whites in the perception of whether police treat people equally. The chasm between these two perspectives is caused by a long, brutal and oppressive history. David’s painting meticulously illustrates that gulf. David’s expression is not the serene setting one might observe in a Monet. There are no sunscapes and lily pads but, rather, an accurate portrayal of this young, achieving American’s experiences with police. His work is a constitutionally protected expression of free speech. Recent incidents send a message to African-American youths not to bother with pursuing excellence because even if their work is recognized, it will be removed by those who cannot understand it and who see themselves as the exclusive arbiters of Americanism. This is sad because history has proved that the mark of a declining civilization is the persecution of intellectualism and art (see Sparta). When Duncan Hunter, Doug Lamborn and their colleagues removed David’s painting, they illegally and dangerously silenced free speech for their own comfort. They should be arrested by the same police whom the painting offended. Furthermore, Congress should censure the uncivilized representatives for their un-American acts in the Capitol. They placed their feelings above what makes America great: the freedom of expression. In the United States, certain groups have achieved untouchable status when it comes to criticism. Citizens may not suggest that policing needs reform without their love of country being questioned. There has been a public shift from constructive analysis of police action to the shaming of anyone who dares to share his or her human experience. These elected officials’ behavior is a clear display of privilege. African Americans get the message: Freedom of expression is only for police-worshipping, privileged citizens. The representatives will likely not be punished because law enforcement and elected officials have far more restraint for white “protesters” than for black resisters. David’s only comment is, “The art speaks for itself.” It has spoken loudly. Now, who will protect American civilization, including our Constitution and democracy?